At Active Life Anti-Aging & Regenerative Medicine, we are committed to providing the most advanced innovative treatments for chronic joint and tendon injuries. One such treatment is Platelet Rich Plasma (PRP) injections used as a regenerative alternative to more invasive surgical procedures. Many people suffering from a variety of orthopedic conditions including shoulder, knee, elbow, ankle and foot pain achieve great results with these safe and natural non-steroidal injections. The injections are an in-office procedure which consists of drawing a small amount of your blood and then using a centrifuge to separate these special PRP cells. Next, the PRP is injected back into the body to promote natural healing of the painful injured structure. The PRP is very concentrated and contains many growth factors ( three to five times the normal blood concentration) and also attracts stem cells to regenerate the injured tissue. There is no risk of rejection as your own blood is used in the procedure. The whole process usually takes under an hour and if used as the stand alone treatment, may require a series of injections (3-5), however there may be significant improvement after one or two treatments. For long standing chronic conditions that have not responded previously to conventional medical interventions (including surgery), adding High Power Deep Tissue Laser Therapy to the PRP protocol can greatly enhance the healing process and achieve the results you may not have thought possible! 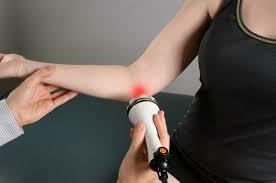 The laser speeds up the healing through a process known as photobiomodulation. Through this process the laser energy causes a photochemical reaction at the cellular level of the injured tissue. This reaction greatly increases cellular metabolism and stimulates energy production to speed up the healing process. This can be looked at similarly to the positive affect that photosynthesis has on plant life. Combine this powerful laser with the synergistic effects of PRP and you have a very safe and potent regenerative treatment to finally get you out of pain and active again! Set up a free consultation to see if PRP with Laser Therapy is your best choice to heal your chronic injury.